These instructions describe how to make an elastic casing at the hip using wide bias tape, suitable for finishing the top edge of a circle skirt, a pair of pantaloons, or any other costume item that is worn on elastic at the hips. This is the very best way to finish a curved hip edge such as that at the top of a circle skirt, but it also works well on straight edges. Before cutting out the garment, it is necessary to determine the finished length desired, then add 1/4 inch (about .64 centimeter) additional to allow for finishing the top edge. That's how much will be turned under for the casing when finishing the top edge of the garment. It will also be necessary to add extra length for finishing the bottom edge - a hem for a skirt, or casing for pantaloons. Which is better to use, elastic or grosgrain ribbon? It depends on what kind of fabric the skirt is made from. Skirts made of heavy fabric won't stay up! Heavy skirts may fall down while dancing. Ensures skirt won't slip down over hips while dancing! Elastic: Measure the hips at the line where the garment's top edge will be worn. Subtract several inches — the elastic should be shorter than the hip measurement so that it stretches when worn. For example, 36 inches (91 cm) of elastic is recommended for a hip measurement of 41 inches (104 cm). The elastic will need to hold up the full weight of the garment, and that's why it needs to be stretched a bit when wearing it. If the elastic is too loose, the garment won't stay up! Grosgrain Ribbon: Measure the hips at the line where the garment's top edge will be. Add 12 inches. These supplies are sold in the part of a fabric store that sells "Notions". Many fabric stores have a huge sign on the wall in that part of the store that says "Notions", otherwise any member of the staff should be able to indicate where to find the notions department. This is straightforward. Choose a color that matches the garment. Most people opt for a cotton/polyester blend. When going to the store to purchase the bias tape, take along a scrap of fabric from the garment to match the color. The bias tape comes in a cellophane-wrapped package of "Wide Bias Tape". This is the kind that's 1 inch (2.54 centimeters) wide. There are 3 yards (a little under 3 meters) in a package, which should be plenty for finishing the top edge of either a skirt or pair of pantaloons. Fabric stores typically place the bias tape very close to the thread and zippers. Most people like to select a package of bias tape that is close to the color of the garment, although it doesn't really matter that much because it won't ever be seen by anybody when the costume is being worn. But choosing a color that comes close to the garment gives the finished garment a more polished, professional look on the hanger, and makes the dancer feel more coordinated and "put together" when wearing it. If an exact match isn't possible, there is no need to worry about it - as mentioned above, the audience will never see the bias tape when the garment is being worn, anyway. As noted above, if the garment is quite heavy, it's better to use a drawstring made of grosgrain ribbon instead of elastic. Otherwise, the garment may slip down over the hips while you dance! The section of the fabric store that sells ribbons and trims is usually near the Notions section. It comes in a variety of colors, so it should be possible to find a color that comes close to the color of the garment.It's not necessary to find an exact match: it won't show when wearing the garment anyway. To decide how much is needed, see the section above under "Supplies Needed". The very best elastic to buy for the top edge of skirts and pantaloons is called "non-roll waistband elastic" and is 3/4-inch (2 cm) wide. As shown in the above picture, it has a texture of bars across it. The kind that has these non-roll bars is strongly recommended - the other kind, called braid elastic, will roll and twist inside the casing when wearing the garment. Elastic normally comes in two colors — white and black. Choose either — it won't show when wearing the garment. Some places sell it in cellophane packages containing one-yard pieces. Others have a large roll of it, and the store can cut the amount desired. 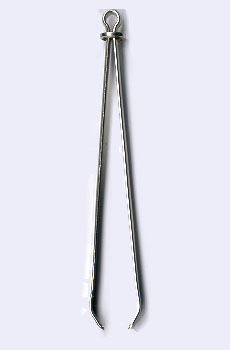 A bodkin is a gadget that makes it much easier to insert elastic into a casing. It is possible to get by without one by using a very large safety pin. Buying one is optional. Many people choose to use a bodkin because its long, lean size and shape make it much easier than a safety pin to push through the casing, and there is no risk of it coming open and pricking a finger. The bodkin can be found in the Notions department of a fabric store, probably wrapped in a plastic "bubble" pack. They're reasonably inexpensive. This drawing shows the wrong side of the bias tape. The right side is the one where the folds point away from the person, and the wrong side is the one where the folds point toward the person. This is an important point to keep in mind when following the instructions below! Place the right side of the bias tape and the right side of the garment's top edge together. That means, when looking at it, if the bias tape is on top and the garment is on the bottom, the right side of the garment will be facing the person, and the folds of the bias tape will be curling up toward the person. Unfold the fold of the tape closest to the garment's top edge, so that the edge of the bias tape is even with the edge of the fabric. This means the fold will be a small distance away from the edge of the fabric. Pin it all the way around the edge of the garment. Curve the bias tape as needed along the top edge. Remember to keep the raw edge of the bias tape even with the raw edge of the garment. Stitch the bias tape into place, so that the stitches go into the fold. Click on the illustration to the right to see the diagram in more detail. When finished, fold the bias tape and garment together along the stitching line, bringing the bias tape to the wrong side of the fabric. Pin it so that it lies flat. Then stitch very close to the outer edge of the bias tape to anchor it in place. If making pantaloons (or any other garment where there is only a single top edge piece to finish), leave a gap of about 1 inch (2.54 cm) or slightly more in this final row of stitching. This opening will be used to insert the elastic. If making several pieces, as with a skirt consisting of several panels, repeat this process on each piece. If using grosgrain ribbon to hold up the garment, hem both ends of it with a hem that is about 1 inch in size. This creates a sturdy foundation for the hook and eye set. The next step is to insert the elastic or grosgrain ribbon. Place one end of it in either a large safety pin or the gripping ends of a bodkin - this is what the fingers will grip. Secure the pin / bodkin. Insert the pin / bodkin into the opening of the casing, and thread it through. Push it through with the fingers all the way to the other end. If there are multiple panels, thread each through in turn, being careful to keep the right side of each piece aligned consistent with that of those already threaded. When done threading the elastic through, securely machine-stitch the ends of the elastic together. If if it was necessary to leave an opening for threading the elastic (as with pantaloons), sew the opening shut. When done threading the grosgrain ribbon through, sew the hook end of the hook and eye set onto one end of the ribbon. Try on the garment. The grosgrain ribbon will probably be a little too long. Determine where the eye needs to go, and sew it in place. It is strongly advisable to sew a second hook and eye set on the ribbon as well. This will ensure that the skirt stays on in the event the main hook comes loose while dancing. This blooper happens more often than people realize! In case of weight loss or gain, or later selling the garment to another person, the hook and eye sets can be moved to accommodate the new size. There are other methods for finishing the top edge of a skirt or pantaloons. So why is the bias tape casing described above Shira's favorite method? Why not just fold over the top edge to make the casing out of the garment's own fabric? Shira's bias tape casing method works very well on curved top edges such as those of circle skirts and decorative overskirts - folding over the top edge to make a casing on those projects is a major hassle! If making pantaloons, which have a straight top edge, a person could just fold over the top edge and be fine. But for anything involving a curved top edge, the bias tape finish is much easier to do! If the fabric is delicate, using bias tape as described here gives added strength to the top edge, and will make the finished garment hold up better under the wear and tear of vigorous dancing. Why not make my own bias tape out of the same fabric I used for my skirt? Assuming the skirt fabric is not delicate, making one's own bias tape out of the same fabric as the skirt is an elegant solution and produces a beautiful result. Shira recommends using purchased bias tape instead of making her own because it's easier for novices at sewing, it saves time, and it's sturdier than some delicate costume fabrics. If added strength is such a good thing, why not use two pieces of bias tape, sewn together, with the elastic running between them and just the top edge of the garment caught between them? A single layer of bias tape can add strength to the top edge of the garment, but sewing the casing entirely of bias tape can create unwanted bulk. A dancer with narrow hips who would like to create the illusion of more width at her hipline may welcome the added bulk of using two pieces of bias tape with the elastic running between them for her casing. Otherwise, by the time the dancer layers a couple of garments (maybe a skirt over pantaloons, with a decorative overskirt on top of that), she may find that using the dual bias tape finish on each garment creates far too much bulk at the top edge. Why not gather the top edge and sew it to a band? Gathering takes much more time than making an elastic casing. Since the top edge of the skirt will be hidden by the belt, the neatness of a gathered edge is not visible to the audience anyway.